I have loved quilts every since I was a young woman. I even worked in Bonnie Lehman's Quilts and Other Comforts store in Colorado when my health necessitated that I step out of my chosen career of nursing for a time as I wasn't tolerating rotating shift work. I had taken a quilting class at Bonnie's Store before she and her daughter started their quilting magazine, Quilter's Newsletter. Her quilt shop was a very spacious and well-filled store and her daughter had a special office there to design quilt patterns that they sold through their catalog and later in their magazines. That was in the 70's, a good many years ago now. I returned to my career(s) but all the while I still dreamed of sewing and quilting while I worked as both a special education teacher and as a nurse to help support my family! How far my dreams have carried me! My next-to-new Simply Sixteen Quilting Machine with The Little Foot frame. My sewing was merely a side-line hobby, though my real talents were not so much in nursing or teaching but rather in art and home arts. My dad was a practical man and had all of us kids go to college! His choices became my alternatives and included becoming a secretary, teacher or a nurse and somehow I got "programmed into becoming a nurse". I became a Candy Stripe Volunteer first so I could have a sneak peek into the medical world and then off I went to college at the University of Colorado's School of Nursing. I was anything but a "natural nurse", unless you count "the art of hand-holding" when patients needed a firm hand to grab when hurt or scared! I went onto became a special education teacher, as I had already mastered the art of learning skills and knowledge that were difficult and had to be learned incrementally in tiny steps. My dad taught me that you don't have to be smart, you only have to work hard, and from this I gathered that I wasn't smart and had better work hard! But when you work hard and still aren't "fitting your round peg into a square hole", I came to realize that neither of my careers, were a good fit, especially with my failing health! Art, my father taught me, was important in making a house a home, but until I married rich, I would need a career like nursing to support myself. I did crafts and held craft shows but it was only a side-line-fun-thing-to-do, more than it was financially lucrative. It did feed my soul and supported my dreams of a nice home and family, and all the usual sorts of things that women wanted in my day, when high tech careers for women weren't so prolific. I never did marry rich, and so I worked to help support my family for a very long time. Nursing wasn't the same as it is today. It was practical knowledge and skills that would serve me well in what I envisioned women were to be: housewives, mothers, supporters and comforters. Little did I know then that it would lead me into making actual comforters and quilts and other domestic arts to make a creative sort of home with comfort to spare. It would help me take care of myself and my family, though instead of applying bandaids to superficial wounds, I would look for concussions and serious diseases! I am now back to my love of designing and creating pretty and useful home arts, and my nursing is used strictly to take care of myself and my family. We moved to Vermont when our kids were little. My husband was seeking better employment and I had become a special education teacher and I figured, I could easily transfer my work to Vermont though I didn't know then, that my career aspirations had peaked and were soon to take a turn for the worse. Vermont seemed to be leading the nation in limiting special ed services and competing with younger and more energetic educators pushed me into doing a refresher course in nursing so I could return to office nursing instead. I tied fishing leaders on the side when work was minimal but one thing remained constant...my dreams of being creative and wanting to do it full time. straight lines up and down and horizontal. It wasn't long after our move that I learned about the The Vermont Quilt Festival...the greatest quilt show in the northeast. It was always in June and for a few years we drove to Norwich, Vermont to see it. The show was not in air conditioned buildings and no matter how hot and humid the weather, I would see all there was to see! My husband took me every year and our daughters eventually joined us. We were delighted when the guild relocated their show to the convention center in Colchester, Vermont where air-conditioning made the shows easier and more comfortable! The Little Foot five foot frame, like you would a quilting hoop. Attending The Vermont Quilt Festival nurtured my big dreams of creating crafts and quilting. Dreams, I learned, come first and their fulfillment later. When nursing became too much for me physically, I put together a studio in my basement and organized my collection of unfinished projects, materials, notions and machines, started a blog and created designer pincushions. I gathered with other artists for craft shows and little by little, Little House became a reality. I continued to dream big and imagined my little house as a home filled with sewing stations and studio space for creating traditional home arts! Participating in local craft markets wasn't just about creating, selling and profitting, though that has helped my collection of materials and patterns grow, but it has brought me together with some delightfully creative people. Continuing to dream big has also brought me back to quilting and "magically and miraculously" transformed my life and my home. 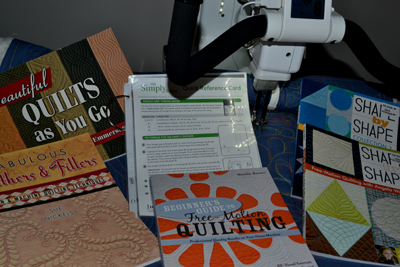 Instead of scouting out new fabric, notions, books and patterns at the quilt show this year, I decided to try different longarm quilting machines. I didn't know when or how I would get one, but I thought refining my dream as to which sort I would want would be the first step. I hoped to one day afford a well-loved used machine and low and behold I found one so reasonably priced that my husband agreed that we needed to check it out at a quilt shop about forty minutes from our home. I thought I was wanting a long arm free motion table top quilting machine that I had tried at the quilt show. I called first to be sure that it was still available. My husband was comparing prices between different machines available and realized sooner than I did that The HQ Simply Sixteen Machine seemed to offer more of what I was looking for in a longarm quilting machine at a similar price to The HQ Sweet Sixteen table model. 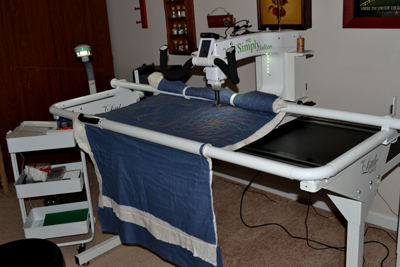 The Simply Sixteen quilting machine is attached to a five foot frame so instead of moving the quilt, the machine moves across the quilt. Despite its small size, its frame works much like an old-fashioned quilting hoop. Simple clamps attach the quilt to the frame, allowing you to quilt a large section and then simply move the quilt to a different location, reattach it to the frame and quilt another section. Practicing some free motion designs with variegated quilting thread. With an added magnetic bar, this machine will do straight line quilting, perpendicular or horizontal, but clamp your quilt at an angle and it offers straight line quilting done at an angle. It is a quilting machine designed to quilt any sized quilt, and like a home machine can use different sized quilting threads, providing you use the right sized needle. 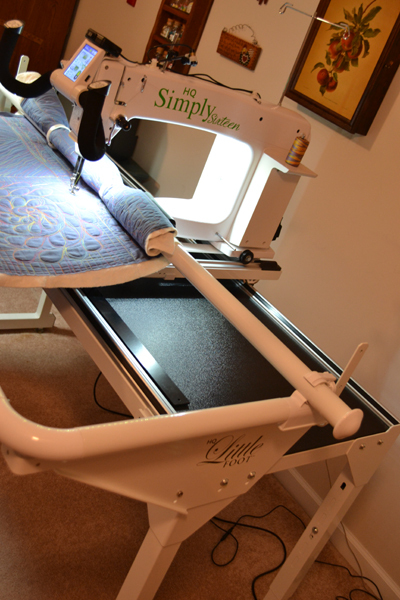 Its five-foot frame is designed to be a more convenient size to fit in smaller spaces than the large twelve foot quilting machines that are often featured. It even has a laser attachment that you can use to trace pantograph designs to be stitched where you want such designs. The laser light will allow me to stitch pantograph designs like these. The settings are simple and easy to learn. It has two settings: manual or regulated. I knew that I wanted stitch regulation as that means that the stitch length is not according to the speed at which I sew but rather the setting as to how many stitches per inch, whether I stitch fast or slow. 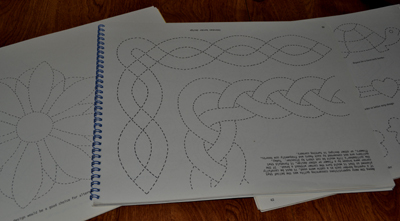 Stitch regulation will give me nice even stitches, despite being a beginner longarm quilter! How much easier to guide the machine instead of the quilt. Big quilts are not easy to manipulate! The only catch in sewing on this machine is perhaps getting the tension set correctly which they claim isn't so difficult, though I think it an art that may take some time to perfect! The owners of the shop delivered it to our house, set it up and then gave us all a lesson as to how to operate the machine. We learned that the tension setting is done by adjusting the tension on the bobbin case, which is something I had learned as I quilted on my home domestic machine, and the upper tension is set with a tension setting knob, like on regular home machines of old and all that I learned about adjusting tension when doing quilting with a walking foot is the same. Good stitches are to meet in the middle and not on the top or back of your quilt. It will take some time to develop "the art of getting the correct tension as well as learning to do free motion designs", but the machine definitely makes it easier to accomplish! Each time I practice it gets easier and I am determined to practice as often as I can to become successful! ...but so much more to learn! My machine was almost new and had only been gently used and came with nearly a full warranty. The previous owner had traded-up for a bigger quilting machine. I definitely don't have room for a twelve foot longarm quilting machine and so this one I think is quite perfect for me. I am still a hand quilter at heart and intimidate easily by big and complicated machines. 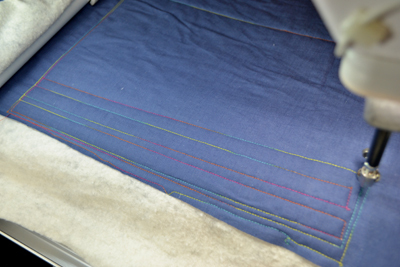 This one seems relatively simple and how nice it will be to have a quilting machine that can be easily used to quilt my quilts, without trying to fit an entire quilt under the short arm of a domestic sewing machine. I know that sometimes dreams take a long time to be realized, but it does seem that my big dream of a little house filled with machines of different sorts, materials, threads, and patterns has in fact come to be. I am truly amazed that little by little hard work and big dreams have paid off, though I give credit to God for all my fabrics, machines and notions for they have all come at the right time and at the right price! I am pinching myself and find it all hard to believe! I must warn you that even when dreams come true, it is easy to feel some stress. Good stress is called eustress and the excitement of it can wear me out! I am still taking time to adjust to being the proud owner of such an extravagant addition to my Little House studio, like it is too good to be true! Surely there must be a catch..and I have learned that there is: it will take me some time before I master this different-sort-of-machine and stitching! I have been assured that it is simply a matter of practice, and it does seem that what little I have done so far, has confirmed this to be true. I have pulled fabrics that are not ear-marked for special projects and or quilts and will make many "quilt sandwiches" to practice quilting. We are going to call them "cat and dog quilts", not unlike moving quilts that will provide some comfort to our animals and or stored delicate objects. 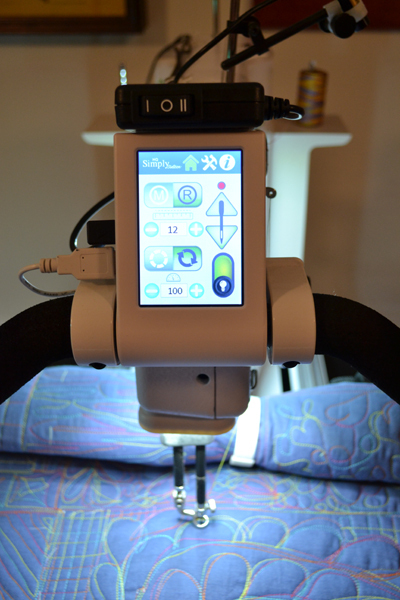 Their purpose is to help me learn to adjust the thread tension, steer the needle with a handle bar and and use the control buttons until they become automatic and then onto my bucket list of quilt tops to quilt! It is a rather meditative art that requires full concentration. Time passes quickly and for now I am content with learning and having fun with it as I practice and continue to create my pincushions and fleece socks for this coming craft season's sales. Once again I have learned that God is not to be limited. Dreaming Big is what I did and God has indeed blessed me with all that I need to be a successful machine quilter! I am pleased and grateful! Congratulations on following your passion! 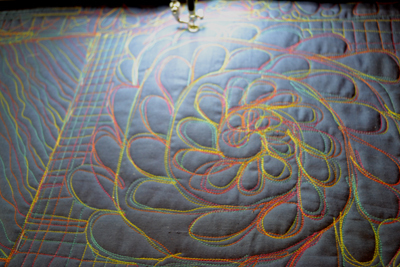 The quilting machine is just toooo cool.Enjoy!